eranroz added a comment to T221295: Wikidata changes doesn't appear in recent changes. Thanks for pointing to that issue. Seems it is the like the root cause and the current task is report about the symptom. Hence I'm closing it as duplicate. If anyone notice any other similar issues, feel free to open a new task. eranroz merged T221295: Wikidata changes doesn't appear in recent changes into T221368: cdnPurge and other jobs fail completely to execute. eranroz merged task T221295: Wikidata changes doesn't appear in recent changes into T221368: cdnPurge and other jobs fail completely to execute. eranroz added a comment to T219837: Complete edit quality campaign in hewiki. eranroz created T221295: Wikidata changes doesn't appear in recent changes. eranroz added a comment to T214678: Revaluate the mobile tagline descriptions for Wikipedia projects. Based on the feedback, we excluded some communities (ruwiki and frwiki) from the rollout. For enwiki - based on T161805 I understand this was intended to be temporally. IDK about the status for ruwiki. eranroz created T218467: edit_restricted_templates to support all Wikipedias. eranroz added a comment to T198534: [BUG] Thumb border images in articles shown are being shown with no border in the Android app. some people in hewiki are asking is there any update about this task or expected ETA? It takes more than a 0.5 year to handle CSS issues. (I know there are tons of other tasks, but please find some time for it. If we aren't sure about other CSS rules - maybe just port only the border and create a separate task to investigate the rest of the CSS) . eranroz added a comment to T207977: remove prev/next message dependency from Language. eranroz added a parent task for T161805: Turn tagline wikidata descriptions off in enwiki : T214678: Revaluate the mobile tagline descriptions for Wikipedia projects. eranroz added a subtask for T214678: Revaluate the mobile tagline descriptions for Wikipedia projects: T161805: Turn tagline wikidata descriptions off in enwiki . eranroz added a comment to T217950: Reevaluate wgAccountCreationThrottle for hewikis. eranroz added a comment to T131183: Remove $wgApiFrameOptions = 'SAMEORIGIN' override for enwiki (English Wikipedia). (just so it while reviewing the configuration) Do we really need it these days? eranroz created T217950: Reevaluate wgAccountCreationThrottle for hewikis. eranroz added a comment to T208188: Proposal for partial opt-out method for Content security policy. 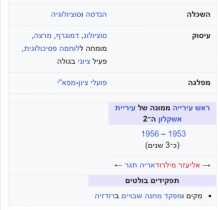 eranroz added a comment to T215467: Hebrew Wikipedia problem with tables and captions in Minerva. eranroz updated subscribers of T214678: Revaluate the mobile tagline descriptions for Wikipedia projects. What are the next steps here - Would you like to get community feedback from ambassadors mailing list? assign UI designer for it? skinstyles are specific to the skin. As described in https://phabricator.wikimedia.org/T198534#4889186 minerva screen defines its own styles and the new styles need to be added here. I don't understand how to replicate this in local dev setup. eranroz added a comment to T215445: comment and actor view challenges for Cloud Services. As comment view is inherently with bad performance, I don't think having separate view for each of the cases is that horrible. eranroz added a comment to T161330: Flow: Notification icons point to different directions. @Bawolff I see no one have commented here in the last weeks. CSP is enabled for ~3 months and there are important privacy concerns with current situation (T207900#4846582). Would you mind closing the RFC and breaking this to tasks based on what was agreed here? eranroz updated the task description for T215467: Hebrew Wikipedia problem with tables and captions in Minerva. eranroz created T215467: Hebrew Wikipedia problem with tables and captions in Minerva. eranroz renamed T215381: Allow move files from Commons to Wikipedia from Allow move files from Wikipedia to Commons to Allow move files from Commons to Wikipedia. eranroz reopened T215381: Allow move files from Commons to Wikipedia, a subtask of T140462: Correctly move files from Wikipedia to Commons (2013), as Open. eranroz added a comment to T140462: Correctly move files from Wikipedia to Commons (2013). My question is similar to the previous ones: Is it going to be possible to change the destination wiki or will it be Wikimedia Commons by default? eranroz created T215381: Allow move files from Commons to Wikipedia. eranroz added a comment to T144480: Move files from Wikipedia to Commons. @Lea_WMDE I think this task can be marked resolved? Or will it be marked once it get out of beta? eranroz added a comment to T215363: Create new editquality labeling campaign for hewiki. Sure I would like to help. Is there a specific message to village pump you would like me to translate or write requesting people to participate in campign? (i don't see hewiki in https://labels.wmflabs.org/ui/ - is this the right place for it)? localizing messages/scripts? eranroz created T215094: ambox styles should have flipped icons for RTL. eranroz added a comment to T212490: Problem with encoding in Zotero results coming from Citoid. eranroz added a project to T214678: Revaluate the mobile tagline descriptions for Wikipedia projects: Readers-Web-Backlog. eranroz created T214678: Revaluate the mobile tagline descriptions for Wikipedia projects. eranroz added a comment to T200968: Support appropriate documentation of CC BY SA data on Commons. @Mrjohncummings thank you for your comments, such comments with good practical usecases really helps to motivate me and other volunteers to improve the software. The current status- I started to work on it (with help and good comments of @Yurik and @Jdforrester-WMF ) but we decided to revert the changes as they were buggy, but I didn't find the time to work on it. will try to get it soon in the upcoming weekends. eranroz added a comment to T154071: Allow non-CC0 licensed data for datasets. To clarify: this task is a legal task. eranroz added a comment to T206024: Create some machine-readable way of distinguishing image deletion notifications by Community Tech bot. eranroz added a comment to T212923: Hebrew link trail should include Gershayim. eranroz updated subscribers of T212923: Hebrew link trail should include Gershayim. eranroz created T212923: Hebrew link trail should include Gershayim. eranroz added a comment to T212165: Enable highlighting Saturdays in "Calendar-Wikivoyage" Extension. eranroz updated subscribers of T211746: [Proposed]Localising template parameter gadget. This is interesting idea and I think this may be very useful for adopting templates between wikis. Liuxinyu970226 awarded T200968: Support appropriate documentation of CC BY SA data on Commons a Love token. eranroz created T211421: auto dir for flow posts. Mrjohncummings awarded T200968: Support appropriate documentation of CC BY SA data on Commons a Love token. eranroz closed T96041: Allow excluding soft redirected categories on Special:UnusedCategories as Resolved. Once that latest patch is merged I think we can consider this task resolved, at least unless we want a Special:ExpectedEmptyCategories too to get the whole list of categories with that page property. I don't think I would ever use a page listing all the empty categories that should be empty (regardless of whether they are empty or not) ever, but I can implement it too if it is really useful for some use case. [[Special:Pagesbyprop]] can list all such categories (regardless of whether they are empty or not), if there will be a later request for a dedicated special page to list non empty categories this can be considered in a seperate task. eranroz added a comment to T96041: Allow excluding soft redirected categories on Special:UnusedCategories. The first part is already done. Now the only thing missing is the Special Page to list categories that should be empty but have at least one member. Any suggestion for the name of that Special Page? eranroz reopened T193198: Use Wikidata international labels when OSM data is not available as "Open". eranroz added a reviewer for D1127: +he translation: Debenben. eranroz requested review of D1127: +he translation. Liuxinyu970226 awarded T200968: Support appropriate documentation of CC BY SA data on Commons a Like token. Liuxinyu970226 awarded T190813: Module for unit conversions a Like token. eranroz updated subscribers of T209183: Lazy loaded images: Copy `usemap` attribute for image maps. eranroz created T209183: Lazy loaded images: Copy `usemap` attribute for image maps. eranroz added a comment to T209016: Is it correct to show RTL content in RTL display mode alongside LTR content in LTR display mode?. This is how we usually handle it in wiki sites. eranroz created T208690: create revision_commentindex. eranroz added a comment to T178249: Parameter for linking a new page to the Wikidata. eranroz added a comment to T136599: [Epic] editing on client. eranroz awarded T207973: GCI: Racconicorn Racoonmendations Sticker a Meh! token. eranroz updated the task description for T207977: remove prev/next message dependency from Language. eranroz added a project to T207977: remove prev/next message dependency from Language: MediaWiki-General-or-Unknown. eranroz added a subtask for T206080: Wikimedia Technical Conference 2018 Session - Architecting core: layers/components/libraries: T207977: remove prev/next message dependency from Language. eranroz added a parent task for T207977: remove prev/next message dependency from Language: T206080: Wikimedia Technical Conference 2018 Session - Architecting core: layers/components/libraries. eranroz created T207977: remove prev/next message dependency from Language. eranroz added a comment to T207698: TemplateWizard is failing to fetch certain templates even when they have TemplateData. I tried to copy it to a local installation and couldn't reproduce the issue. Looking further into the DOM, this is actually due to CSS class name clash - namelly "parameters" class being used for local gadget and adds additonal settings in Common.css. eranroz created T207353: Internal Copyvio handling/reports on Wikipedia mirrors as copyvio. eranroz added a comment to T207342: CopyPatrol not showing the highlighted text. Were are we at with getting the patch fixed? and carefully test it with different configurations to fix all the issues. eranroz added a comment to T201073: Copyvio: Make Eranbot call PageTriage with copyvio info. eranroz added a comment to T155368: Add monolingual language code hbo (Biblical Hebrew). After trying to find resources about hbo I got even more confused - I'm not sure if this is even a language. eranroz updated subscribers of T206024: Create some machine-readable way of distinguishing image deletion notifications by Community Tech bot. The intention is to track changes relevant to wikiproject using related changes. (+tag: #Image+up+for+deletion+on+Commons) That way, other users from the same wikiproject can help with finding replacements for the images pending for deletion. eranroz added a comment to T205917: iThenticate not permitting logins for CopyPatrol. Thanks for the quick response from ithenticate, the account re-activated, should work now. eranroz added a comment to T205056: Visual editing cache should refresh after connecting to Wikidata item. eranroz added a comment to T191757: Investigation: Edit existing templates. This sounds fine to me but there's still the open question of what do we do when we prepopulate the wizard and then the user hits the Trash button and creates another template. Do we insert the new template or replace the original one? eranroz updated the task description for T205120: VisualEditor open incorrect transclusion dialog. eranroz added a project to T205120: VisualEditor open incorrect transclusion dialog: Parsoid-Edit-Support. eranroz created T205120: VisualEditor open incorrect transclusion dialog. eranroz updated the task description for T205056: Visual editing cache should refresh after connecting to Wikidata item. eranroz created T205056: Visual editing cache should refresh after connecting to Wikidata item. The wizard first expands the selection to cover the full template the cursor is in, and then loads the dialog for editing. eranroz added a comment to T202318: Deploy Commons deletion notification bot on hewiki. PS: note that any suspected diff that is written to DB is also reported to the API. Done (commit) and updated the tool on labs. eranroz triaged T204102: DISPLAYTITLE containing aliases of NS is not well defined as Lowest priority. eranroz created T204102: DISPLAYTITLE containing aliases of NS is not well defined. eranroz updated subscribers of T191757: Investigation: Edit existing templates. @Mooeypoo Thank you for opening this discussion about selection. I think trusting the user selection is consistent with other tools of image/link but it is good idea to rethink about it because templates unlike links/images can be much more complex and the you have good points above. eranroz renamed T33780: WikiEditor dialogs kill the undo buffer from WikiEditor dialogs kill the undo buffer in IE and Chrome to WikiEditor dialogs kill the undo buffer. What's involved in parsing the template from a textarea? Can we offload this to Parsoid or reuse code from Vorlagenmeister/TemplateParamWizard? eranroz claimed T191757: Investigation: Edit existing templates. eranroz added a comment to T202914: Spike: How long does it take for a newly created article or draft to be scored by Eranbot/Turnitin. eranroz added a comment to T203012: Copyvio: make it so that all new pages are scanned, regardless of size. We can't scan all new pages regardless of the size, for 2 main concerns: many of the edits are minor and this is waste of credits + we will likely have too many false positives. @Etonkovidova can you please grant EranCopyvioTest this right on https://en.wikipedia.beta.wmflabs.org ? thanks! eranroz closed T132145: VE Clickjacking vs Inputbox in editintro as Resolved. someone, Somehow, somewhen, has already solved it and it works. eranroz updated subscribers of T203213: Visual Editor works as LTR in all RTL Wikimedia wikis.